I’m a long-time fan of Mythras. In many ways it’s the Rolls Royce of the D100 gaming world, being clean and dignified, as well as being a robust ruleset. It came from the same branch of the D100 systems tree, Mongoose RuneQuest (MRQ), as my own OpenQuest (OQ) and while I cut down and rationalised the MRQ SRD, Mythras’s authors (Lawrence Whitaker and Pete Nash) kept the complexity added with MRQ and refined it. I’ve promised myself that I would do a quick review of Mythras and its supplements when it came out two years ago in 2016, and the current Bundle of Holding seems to be an excellent time to do that. So if you are wondering whether Mythras is for you, read on. For me, Mythras is the logical inheritor of all the non-Gloranthan RuneQuest (RQ) that got played in the 80s/90s via the Avalon Hill RQ3 ruleset, which us lucky Brits got via much improved Games Workshop hardcover releases. It came via Mongoose Publishing’s efforts when they had the RQ licence in the 2000s. Mythras’ authors Lawrence Whitaker and Pete Nash were then Mongoose staff writers who were tasked with producing a second edition of the somewhat wobbly first edition. This they did to much acclaim, and when Mongoose lost the RQ license, they put out the version of the MRQ2 that they wanted under their Design Mechanism moniker as RQ6. Mythras is the final link in this chain of releases, highly polished, with its own name and with all the Gloranthan references removed. 305 pages of clearly laid out text, with clear black and white line art. Very evocative of the games’ 80s/90s roots. The Pdf is fully bookmarked, and the contents, index and in page cross-references are all fully functional hyperlinks. I’ve got the printed version, which is a very robust and cleanly printed hardcover which I can see easily surviving many years of use/abuse. What are characters like in Mythras? Well, they are mythic but based on realism. So you could quickly do the heroes of Homers Iliad/Odyssey with Mythras. They have exceptional abilities, but are fragile and bleed, with even the mightiest hero being at risk of death by a well-placed lucky blow by a minor character. Each of these sections focuses on building the characters’ abilities up while putting them in context of these three areas. For example the Culture and Community chapter, gets the player to decide which culture the character comes from (Primitive, Barbarian, Nomad, Civilised – are the defaults in the core rulebook) and from that they determine what social class they are members of that culture, as well as what ties and bonds (known as Passions) they have to fellow members. The chapter ends with a Background Events table of 100 entries. I’m a big fan of these (after first coming across them in Cyberpunk 2020 in the early 90s) since they stop characters who are numerically the same being identical and give the character an excellent in-built adventure hooks. The skill system is a roll equal or under percentile system. Each character (and monster) has a set of percentile skills that when it’s not clear what is going to happen are tested using two ten-sided dice. Extra levels of success and failure are brought in with special results. If you succeed in the lower tenth of your success range (for example if your skill is 40%, 1-4%) you Critical, conversely if you fail and roll 99-00% you fumble. That’s the basics of it, and there are numerous quick and easy subsystems which elaborate on what happens in certain circumstances. Combat gets a chapter of its own. Mythras combat is the most complex of all the D100 systems but is well thought out and streamlined. If you don’t want to use all the options, such as combat effects which bring in special effects dependant on weapon type on a critical, the system is modular enough to drop these without breaking it. D100 fantasy lives and breathes on its magic systems which unlike D&D is flexible and based upon spells costing magic points to cast. Mythras has five magic systems, which all share common features while having their own differences and focus. Folk Magic the most common but least potent of all the magic systems. It gives characters quickfire utility type magic , such as Bladesharp which offers extra damage points and an improved chance to hit, with low bookkeeping. It’s the type of magic that if your players want a little bit of magic to improve their characters without magic becoming their speciality or focus. Theism is the magic provided by the gods. It’s much more powerful than folk magic but similar in complexity bookkeeping wise. While you don’t need to spend Magic points to cast spells your character does have a relationship with a deity that you need to maintain to keep on using their magic. Animism is primitive magic from using bound spirits. It’s flavoursome and powerful but relies on the character having a good relationship with the spirit world, and the player getting their head around the concept of spirits. Sorcery is the most flexible type of Mythras magic, and while much more straightforward and playable than its RQ 3 roots, still requires the player to want to dedicate time to working out how the Sorcerer’s spells work the best for them. i.e. it’s only really for players who want to play a magic using character. Mystic covers those characters who use magic as an expression of their physical and mental skills and is quickly set up to do Martial Arts type characters. The book finally has three chapters which fill out the Mythras rules framework. Cults and Brotherhoods. Cults are the mini-religions that D100 systems classically use to provide magic and skills training to characters, as well as make their lives interesting with all sorts of inter cult politics. Mythras has a good selection of pre-made examples for each of the magic approaches but also includes non-magical Brotherhoods. Creatures. In D100 games “monsters are people too”, and Mythras continues this approach giving full stats. Skills and magic for its creature descriptions, which are more templates for the GM to create unique individuals for their games. Also where relevant extra information is given if the creature is suitable as a player character race. Games Mastery. This GM’s advice section rounds out the whole nuggets of advice that pepper the entire rulebook , with a short, robust article which highlights the features of the game and how best to use them. Overall Mythras is a complete standalone game, but it is missing a starter adventure – but behold there is a free pdf “Games Masters Pack” which has two introductory adventures and lots of follow up adventures/setting books (some of which are included in the Mythras Bundle of Holding). If you are coming from D&D and are looking for an alternative to rigidly enforced class/level system, were characters organically grow through play and their in-game experiences and can try anything they want to. 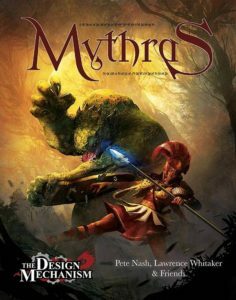 Mythras is well established and has a wealth of adventures and setting books, some of which go beyond the established mythic fantasy of the core rulebook. The recently released After the Vampire Wars, explores modern day horror, while Luther Arkwright: Roleplaying Across the Parallels, based upon the Brian Talbot graphic novels of the same name, is weird time-travelling science fiction. You are a diehard storygamer. Mythras while being a cleaned up and up to date D100 ruleset, is still very much a traditional old-school game from the 1980/90s. It has all hallmarks of that gaming style: characteristics that map back to statistics that can be physically quantified, a clearly defined Gamesmaster/player split with well-defined roles and responsibilities, and a system that is literally peppered with modifiers and rules that simulate the gritty reality that characters find themselves in. Mythras (and other D100 variants) does support a storytelling style of play, because of its freeform character advancement system and skill use system, but you have to engage with it and understand that to get the best out of it. It doesn’t lead you by the nose, hard coding it into lightweight rules systems like story games like Fate or Powered by the Apocalypse games do. Coming next in Mythras Review: Mythic Rome.